Manufacturer & Exporter of Dry Ice Plants. Our product range also comprises of CO2 Recovery Plant, CO2 Storage Tank and CO2 Generation Plant. Dry Ice Plants offered to come in quality fabricated finish and are well recognised in the market for developing of fry ice (solid carbon dioxide). These plants provide for effective production of Dry Ice that is used in varied areas like in carrying out heat sensitive chemical reactions; hardening of blades; doing of shrink fitting for achieving closer tolerances among others. Here, our expertise lies in developing plants in a different configuration for different applications including in options of cylindrical blocks and rectangular blocks. The plant's size range from 45 kg/hr to 300 kg/hr. 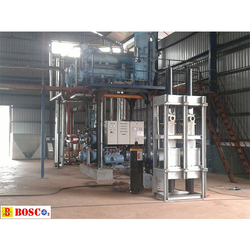 Looking for Dry Ice Plants ?